A pretty crazy movie about a stranger stopping into a town full of bizarro characters, where he gets into one mess after another. A movie about a stranger who wanders into town to get his car fixed and then finds himself kind of stuck there, as he gets involved in all kinds of schemes with the locals, this movie plays more like a Twilight Zone episode than a typical film, and is all the better for it. There’s a cautionary tale here, about a man who didn’t pay his gambling debt, lost two fingers at the hands of a bookie, and found that to be just the start to his problems. The characters that Bobby comes across in this town are wild and crazy and a bit ferocious. The movie has the good sense not to give us too many of them, snd instead to really just develop each character through multiple scenes. This is a movie that takes place all in one day (for the most part,)and you really feel like the beats of the day are hanging onto you, so that Bobby gets tired and so do we. The mid-section definitely drifts a little, as things start to feel repetitive, but the movie gets right back on track once it addresses ways to take the plot even further down the dark hole of betrayal. 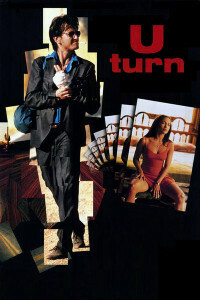 U-Turn is a cross between a black comedy and a film noir. If it’s a black comedy than it’s dark as hell, with the only real comedic elements being how much can go wrong for this one guy. I suppose it’s also kind of funny how off-the-wall crazy some of the characters are. Mainly Joaquin Phoenix’s character, Tobey N. Tucker, and his girlfriend, Jenny. But the film noir elements are all there, from the plot about characters wanting him to kill for them to collect insurance money (Double Indemnity,) to the femme fatale who just might be setting our protagonist up. That protagonist is Bobby, played by Sean Penn in a role he was kind of made for. Bobby is a gambler who couldn’t pay off his bookie and lost two fingers as a result. He has since gotten the money together, and just has to make it to Vegas to deliver it. Only there’s one problem. His car breaks down in the middle of an Arizona desert. Luckily he’s close enough to an exit off the highway that he can get it into town, but this town will be his downfall as he finds himself surrounded by the strangest and most conniving characters imaginable. This town is Superior, Arizona. Bobby’s first stop, once in town, is to a mechanic’s shop named Harland’s. The mechanic, himself, is named Darrell (played by Billy Bob Thornton,) and he’s the greasiest, dirtiest screwball you’ve ever seen. This guy takes apart Bobby’s car, sells the things he finds in the trunk, and puts up a sign that says he’s selling Bobby’s car. He rips apart the key hole to the trunk so that Bobby can’t get into his own trunk anymore, and continues ton find more things to charge Bobby for, saying he did new things to the car that Bobby never agreed to and didn’t even know about. After Darrell, Bobby meets a blind man, played by Jon Voight. This character exists just to be weird and creepy, and doesn’t really add anything to the plot. He certainly adds a lot to the atmosphere and tone of the movie, though. The blind man seems to be a sort of Native American, at least in spirit, if nothing else. He tells the story of how he lost his eyes by going for a woman who had a jealous husband. He also sits there with a dead dog laying at his feet. And he spends all day sitting out in the hot sun on a bench, right in the center of town. While sitting there talking with the blind man, Bobby spots Grace, a hot young Latina who is carrying boxes of drapes to her car. Bobby runs over to help her, continuing to call her “beautiful,” until she tells him her name. Grace accepts his help and then offers to drive him over to her place, where he can take a shower. The scene where they share their first, passionate kiss, is fantastic, because Grace plays with Bobby, rejecting his advances and then asking him what he really wants. When he tries to play it cool, saying he wants the same thing she does, she won’t have any of it, and just talks about hanging the drapes. She doesn’t want him to put it on her. If he wants something, he has to take it, and that’s what Grace gets him to do. Grace is married. Her husband, Jake, shows up and isn’t exactly thrilled to see Bobby and his wife locking lips. 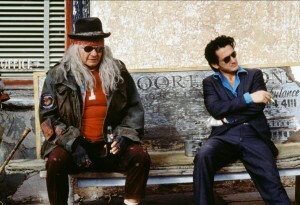 Bobby leaves, and walks off, heading back to town, when Jake pulls up with a ride and a proposition. He wants Bobby to kill Grace. There’s large insurance money ready to be collected, and Jake wants to split it with Bobby. The money that Bobby had, that he was driving to Vegas to deliver to his bookie, got shredded in a grocery story robbery where his bag got blasted to pieces by a shotgun. So now he needs money, bad, and Jake gives him the first offer towards getting it. Grace has another one for Bobby. She wants him to kill Jake and talks about the secret safe Jake has hidden away, and what’s inside. And while Bobby’s trying to figure out what to do with the two of them, and how to get his money, he meets Toby and Jenny at a diner. Jenny pulls up a seat next to Bobby and starts talking to him and Toby, her loose cannon boyfriend, sees this and comes running over. He wants to fight Bobby, and nearly does, until the sheriff walks in and things settle down. The sheriff is played by Powers Boothe, and he seems like the only character who isn’t a little nutty in this town. The sheriff seems to be pretty close with Jake and Grace, and Jake seems to be pretty close with Darrell. It’s one of those small kind of towns where everyone knows everyone and knows everybody else’s business. And there are secrets being kept from Bobby, the stranger, that will come out during the course of the film. The movie takes place almost entirely in one day. Aside from a tiny bit of a bookend to round out the final scenes, this is a one day movie, and that’s pretty cool because it means we follow Bobby to the mechanic and then away from the mechanics and into town to kill some time. And during the day, despite whatever happens to him and which characters he meets, Bobby continues to leave the town every now and again, to go visit the mechanic and check up on his car. And every time he stops by Harland’s, the status of the car is a little bit worse. The stakes definitely build in this one, between Bobby and each of the other characters. The more they get to know him, the deeper he gets into trouble with them. Most things about this movie work. The storyline and characters definitely work. The performances are great. What doesn’t work is the repetition. From the jokes, (every time Bobby meets a new character, he is asked about what happened to his hand and then given then exact same response, that he needs to be more careful,) to the rule of three, (he meets most characters in this movie exactly three times, be it the blind man, Toby and Jenny, or going to Harland’s mechanic shop for three day time visits.) The movie also seems to drag somewhere in the middle, because it starts feeling like the same thing, again and again. Maybe it’s the characters who aren’t really contributing anything, like the blind man, slowing things down. But once we jump back into the plot, with Grace and Jake and what Bobby is going to do about them, things pick right back up again, and we are back to having a cool and darkly disturbing movie. This film is all about environment and style. It’s an Oliver Stone movie, snd his first one since becoming a mainstream director, where is he is working on a movie that has no political ties, and is also good, (Natural Born Killers, made a few years earlier, avoided the politics game, but wasn’t exactly great either.) U Turn is insanely dark. Not only the humor, but the characters and things that happen to this guy are dark, to the point where this movie is certainly not for everyone. But it sure is pumped full of life and craziness. While the Jon Voight character doesn’t add much, most every other character in the movie does, and one is funnier and more disturbed than the next. And, on top of everything else, the movie ends up going in a very interesting, Shakespere-like direction with characters finding themselves faced with deteriorating relationships and betrayal. This movie definitely has some flaws, (Stone’s jumpy, quick cuts filming style is a little annoying,) but it’s still a live wire that ends up being a lot of fun.